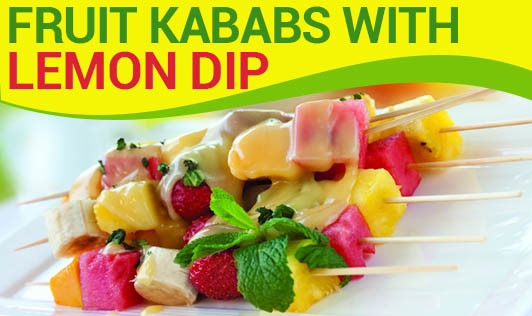 Fruit Kababs with Lemon Dip! Fresh fruits can refresh you any time of the day! Let us make fruits more interesting and appetising with this simple recipe which can be a yummy dessert or just a new dish for your fussy child to try out! • In a bowl, whisk yogurt, lemon juice and lemon zest together. • Cover and refrigerate till it reaches your desired chillness. • Thread in fruits into the skewer. • Serve it with lemon dip. Tip: These fruit kebabs work well with any type of fruit, including exotic fruits. You can prevent the fruit from browning by dipping it in orange or pineapple juice.